Thomas Corner Eatery sits alongside the river in Noosaville. 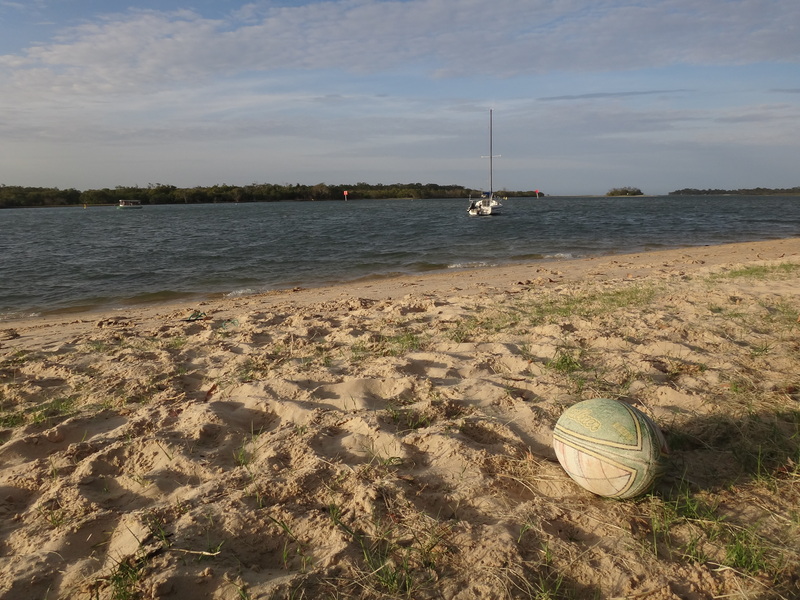 It’s a ten minute drive from Noosa Heads (or a $10 to $15 taxi ride). I discovered Thomas Corner Eatery in an article about Noosa in Gourmet Traveller magazine. David Rayner and Belinda Frew are owners with a very clear vision – to bring to locals and tourists a ‘relaxed and informal eatery, honest and intelligent food, with no frills, froths or fancy garnishes’. On seeing this vision/philosophy boldly on the menu cover I knew it was a place to Feast Wisely. The restaurant offers thoughtful and interesting dishes in a casual setting. 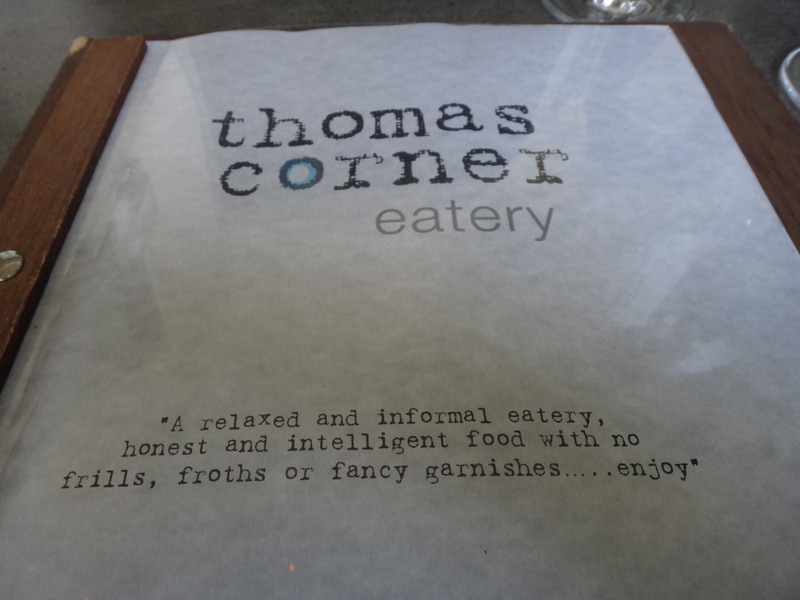 David and Belinda opened Thomas Corner Eatery in 2010 and have clearly remained close to the detail. Belinda emailed me directly when I sought clarification (anonymously) on a dish to help with this write up. I booked for an early seating to make the most of the water view. What’s great is that all of the tables are undercover but many offer an alfresco feel without you being outside. So you’re protected from the elements (I’m talking Noosa rain). On booking I mentioned that we were visiting to celebrate an anniversary. And, to my surprise we got a fantastic table – lounge style corner seating alongside the window, and a complimentary glass of bubbles. A lovely gesture that was followed by service that shows a real warmth for customers. The choice of starters was not an easy one. The Noosa spanner crab sounded tempting as did the smoked fish salad. But we decided on the the marinated olives ($7), duck liver parfait ($17) and the sardine fillets ($19). How many places tell you the origin of their olives? Not many. Often I wonder if some restaurants use supermarket style jars and drizzle a few olives in oil when an order comes in. Not at Thomas Corner Eatery – here the menu proudly notes that the olives come from Pendleton farm, a family owned business in South Australia. 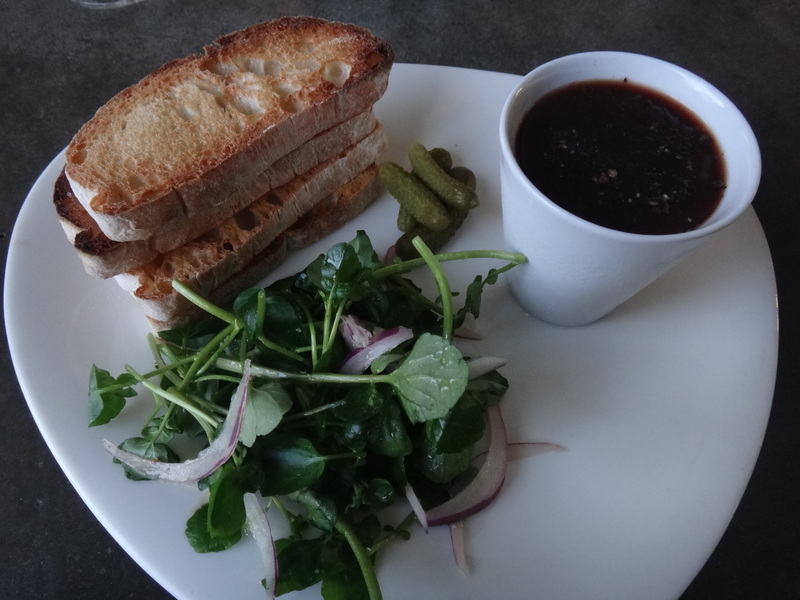 The duck liver parfait is served as a generous portion with toasted sourdough. It had clearly been prepared in house and was smooth and full of flavour. 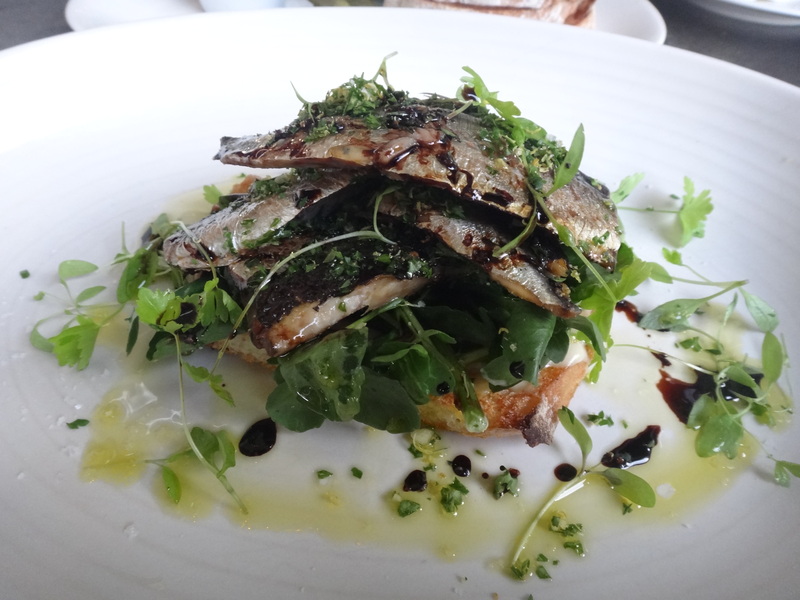 The sardine fillets are served on toast with white eschallot, lemon and parsley and drizzled in vinocotto. The flavour of the fish was balanced by the simple dressing. I’d return for this as a light lunch. I had to try the lamb shoulder for main. Not least to compare it to my own recipe for slow-cooked lamb shoulder. On the menu it’s described as braised lamb shoulder with orecchiette, gympie beans, tomato, rosemary and mint gremolata ($32). I expected the orecchiette to be the centrepiece. 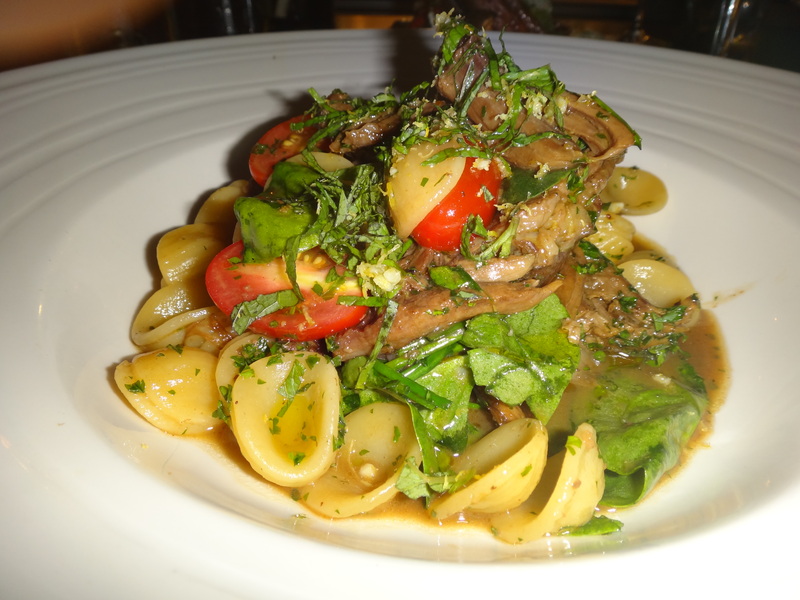 But that’s not the case – the lamb is the hero, complemented by a light serving of pasta. Great for lamb lovers like me. Even pasta lovers can breath a sigh of relief – the carb content is low enough to justify dessert. I’d love to see the origin of the lamb mentioned on the menu. And if I’m being really picky I’d suggest the lamb could be cooked for even longer but at a lower temperature. After slow cooking lamb shoulder many times I’ve found the longer the cooking time and the lower the temperature the better the results. I’m talking even 12 hours at 90 degrees! Which one did we chose? On this occasion it was based on the ‘have we or could we cook this at home?’ Duck fat roasted potatoes are a regular accompaniment to a roast at home and after much practice I’m confident that I’ve nailed them (see how to make your own duck fat here). So, with the hope of being inspired, we decided to try the sweet potatoes. Had we stayed for dessert I’d have probably been tempted to try the simple house made chocolate brownie. 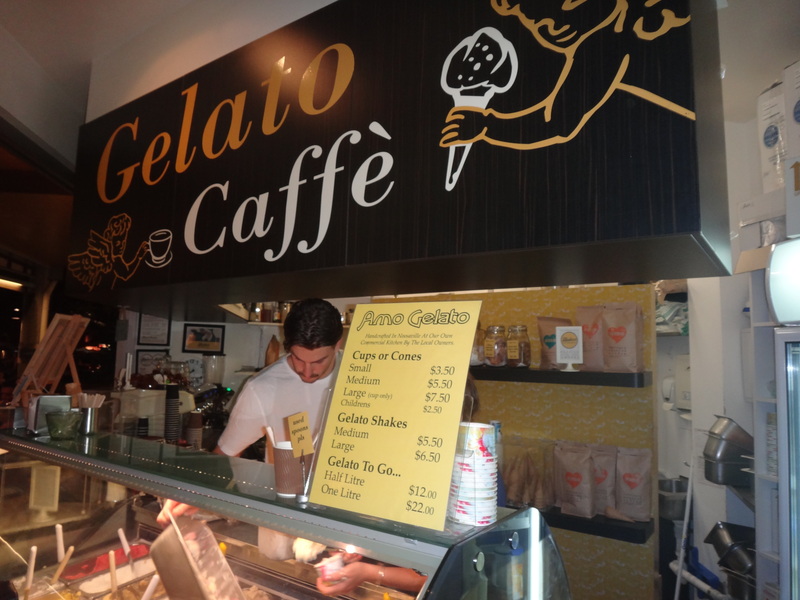 But the the handcrafted ice cream at Amo Gelato next door was calling my name – see my post on Amo Gelato here. Overall quality Australian produce served simply, letting the flavours shine. That’s what Thomas corner is aiming to do and they’re doing a great job if it. Between 3pm and 5.30pm stop by for bar snacks – for just $20 choose between different deals that include nibbles and a drinks. For example six freshly shucked oysters and a glass of French sparkling. You get ‘plenty for your 20’ as they say on the website. Looking for a fine feast but need to cater or hungry children? The menu includes a ‘kids corner’ section. For $14 your little ones can choose from chicken, pasta, fish or meatballs (subject to change of course). The menu offers lots of options for gluten free diets. At eat the time of writing seven of the starter dishes, five of the main and most of the sides are gluten free (as displayed on the menu). 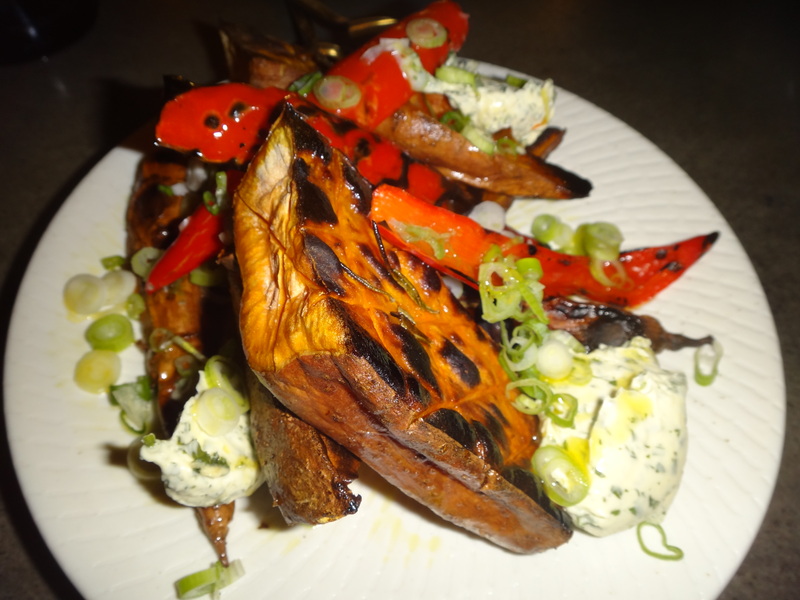 Tags: menu, Noosaville, restaurant, review, Thomas Corner Eatery. Bookmark the permalink.